Danielle and Michael held their Washington DC area wedding at the beautiful Four Seasons Baltimore, where they celebrated both a wedding ceremony and reception with loved ones. 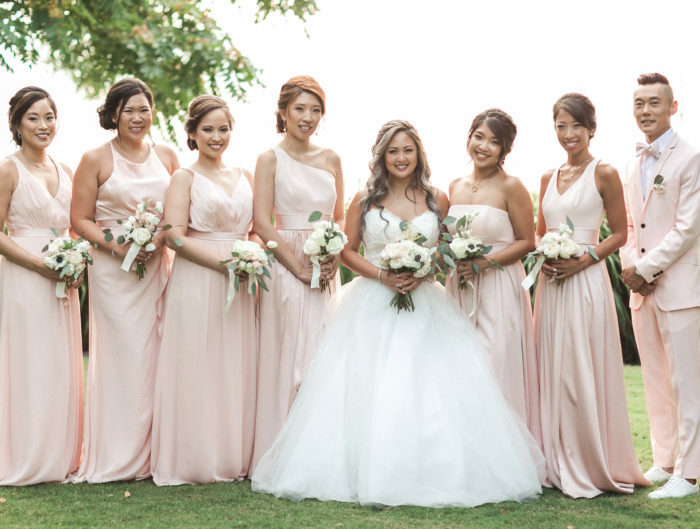 Their fall wedding used pops of color that fit the season – dark blue, and a few lighter tones, like white and pink to add a romantic touch to their wedding day. No wedding detail was left undone at Daneille and Mike’s big day and their wedding ceremony design proves it! 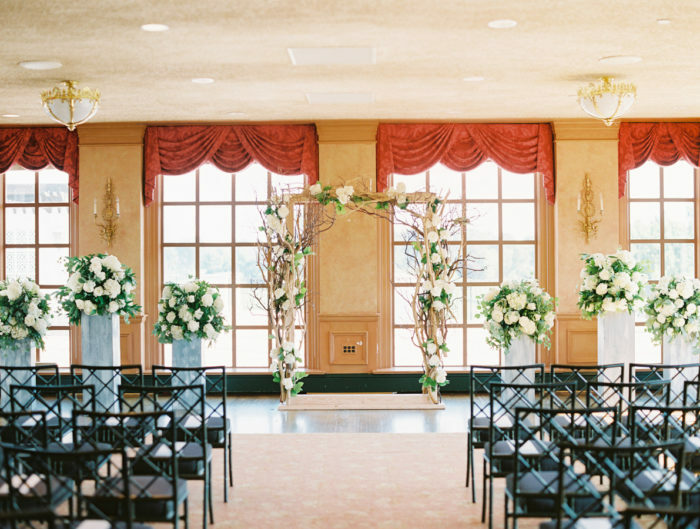 Using gorgeous patterns and even an ombre floral petal trimmed aisle, their ceremony was designed to perfection. The only thing that made it more beautiful was the blushing bride and dashing groom as they said “I do” and with all smiles! I can’t get enough of this couple in front of the unique wedding ceremony wall that was built behind them. 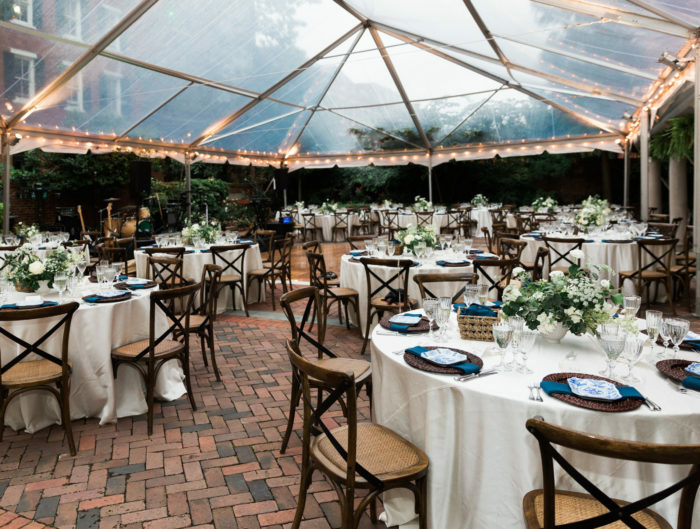 A special thanks to the talented Mary Brunst Photography for sharing Danielle and Michael’s wonderful Baltimore wedding with us! From the bride: The main priority for our wedding was that we wanted our wedding to be at a beautiful location and we really wanted our wedding guests to enjoy their time. We fell in love with the Four Seasons the minute we walked in! The location right on the water was exactly what we were looking for. Mike and I knew that the majority of our wedding guests would be traveling for our wedding and we felt that the Four Seasons would provide a great escape for our guests. Plus, the staff there is unbelievable – they were extremely helpful from our first meeting right up to and including the day of our wedding. Our wedding ceremony and reception were special to us, because it was small, intimate, and the most important people in our lives were all able to attend. Our parents took a big part in our wedding day. Both of our mothers did the ceremony readings. The scripture passages meant so much more to us because the words were spoken with so much love. Mike’s father did the prayer at the wedding reception, which was unbelievable. He really spoke from the heart. My father did the toast and I don’t think there was a dry eye in the room. My dad and I have always had a very close relationship and his words meant so much to me. Congratulations to Danielle and Michael! Thank you for sharing modern Four Seasons wedding ceremony with us! Stay tuned for their seafood filled, gorgeous pink, white, and blue reception that we’ll be sharing with you!